Reconnect Rochester surveyed all candidates for Rochester’s Mayor and City Council to learn where they stand on issues related to transportation and mobility. Questions were designed to give the candidates the opportunity to share their opinions, ideas and vision for a well-connected and accessible community. Surveys were sent to all campaign teams on August 2. We did our best to make contact with all of the candidates. After several follow up attempts, the responses we have received are posted below. We hope this information will help you make an informed decision when you head to the polls this November – and/or next Tuesday (9/12) for the Democratic primary. Don’t want to wait until election day? Take our Voter Poll right now (just for fun). What is your vision for Rochester’s transportation network? How do you plan to achieve that vision? Our current public transit system is not set up to address the needs of our residents, many of whom are forced to work and shop in the suburbs. We need a network that better connects people to jobs and services. We need a network with various hubs. We need a network that accommodates pedestrians and cyclists. We need a network enjoyed by all. We must introduce planning and transit into discussions about awarding incentives to companies relocating or expanding. We need a mayor who will advocate for locating jobs and services in the city, near transit lines and population centers. 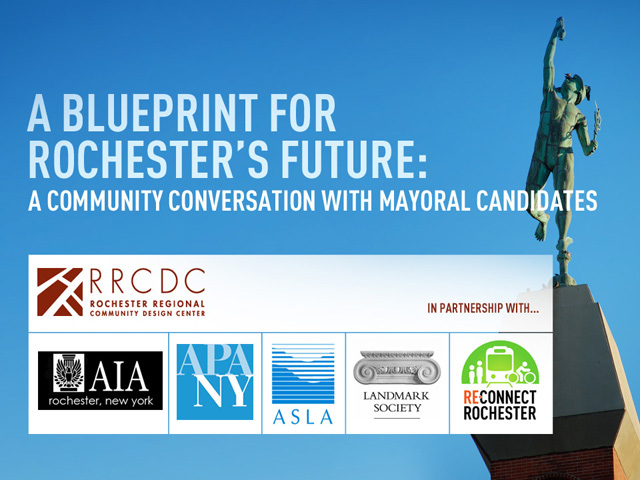 What are Rochester’s greatest challenges in regards to transportation? Our greatest challenge is that we have a community that prioritizes the automobile. This has had enormous economic, social and environmental costs. What role do you see City government playing in building a more robust and equitable transportation network? We must fight for Rochester’s share of transportation funding from the state and federal government. We must prioritize pedestrians and cyclists when building infrastructure. What steps can the City take to improve accessibility to jobs for residents who do not own cars? And, what steps can the City take to encourage residents who own cars to increase their use of alternative modes of transportation? In addition to building infrastructure, the city has to advocate to locate jobs in the city, on transit lines and near where people live. The city should encourage the University of Rochester, Wegmans and other employers to give workers free bus passes. By adding infrastructure, such as protected bike lanes, more people will feel safe to ride bicycles. Broadly, what is your vision for improving the parking situation downtown? I don’t think downtown has a parking problem. It has a walking problem. People think nothing of parking at Eastview Mall and walking the equivalent of a half mile to get to a store. We need a mental reset about what it means to visit a downtown. That said, it’s worth exploring a downtown circular to transport people among venues and garages. How do you think the City should prioritize traffic enforcement relative to other issues? Traffic deaths are not “accidents.” They’re preventable tragedies. They’re unacceptable. They’re not inevitable. That’s how the city will treat fatal and serious injury crashes under Vision Zero Rochester. The first Vision Zero program started in Sweden in the late 1990s. Now there are Vision Zero programs in many cities. The aim of Vision Zero is to have zero deaths and serious injuries in road traffic. Vision Zero takes a multi-disciplinary approach to traffic safety. It recognizes that people make mistakes. Instead of blaming victims, we will improve the system to mitigate human error. Using education, enforcement, design, technology and policies, we can make our streets safe for everyone – while not impeding mobility. Do you support studying the feasibility of modern streetcars, downtown circulators, and various rapid transit options for Rochester? Why or why not? Reducing reliance on cars makes for a healthier, more equitable city. Do you support a “Vision Zero” style approach to road safety, which includes a 25 mph speed limit on residential streets in the City and other traffic calming practices and policies? Why or why not? Do you support the continued expansion of a bicycle lane network throughout the City? Why or why not? Adding bike infrastructure promotes activity, social equity, cleaner air and vibrant street life. Do you support road diets or significant changes to road configurations to improve safety on any major roadways in the City? Why or why not? If yes, which ones? Road diets slow traffic, making us safer, and they improve property values and walkability. East Main Street desperately needs a road diet. What steps (if any) do you think we can take to encourage employees (especially City employees) to commute using transportation options other than single occupant automobiles (walk/bike/bus/carpool/etc.)? As noted above, we should encourage employers to spring for bus passes. We can also ask them to include facilities for bikes and provide incentives for carpooling. Are there any other comments or thoughts you’d like to share? Unfortunately we did not receive a response from Tony Micciche. Rochester’s transportation network must address the needs of all of our citizens with an eye toward dramatically reducing carbon emissions (see my environmental platform, “Green Rochester Inside and Out,” available on www.sheppardformayor.com). My vision for the City is that all of our residents will have inexpensive and accessible choices for getting where they need to go, for work and play. We are fortunate to have a community of smart, creative and engaged citizens who are passionate about this issue, the members of Reconnect Rochester among them. Within the first six months of taking office, I will hold a Transportation Roundtable to bring stakeholders together, including RR, RGRTA, Genesee Transportation Council, residents, business owners, transportation experts and others to evaluate our current transport network, review the plans that are in the works, and determine an action plan for moving forward. I don’t have all the answers but there are people right here in this community who have a lot of expertise and interest and are willing to share it. An aging infrastructure and high poverty. We have significant capital needs that are difficult to address when our tax base is shrinking, which often forces us to prioritize emergency repairs. That being said, other communities have gotten creative with their financing of transportation projects and aggressive with their State and federal funding requests, and we can too. The City needs to play a leadership role as transportation directly impacts the quality of life of our residents and the long-term environmental health of our community. The City in particular must demand equity in regional transportation planning efforts, as our residents are often the least served and most in need. We must ensure our residents are at the table, whether they want to put roads on a ‘diet’ and increase bike lanes, or increased bus service and updated shelters. We need to ensure that our residents are empowered and actively involved in solving Rochester’s transportation needs. We need to do a better job of working with major employers and the business community to identify the current and future needs of their employees. They know as well as we do the challenges their employees face in getting to work on time and on budget; employees who can get to work easily are more likely to show up and stay employed. Once we have a more thorough understanding of what our current and future needs are, we can plan accordingly, working with RTS, and using van pools, car sharing and bike sharing alternatives. The City can be an active leader in promoting alternative modes of transportation through events such as “Bike to Work” days, free public transportation periods, and “Celebrity Van Pools,” as has been done in other communities. In promoting our own special events, information can be shared on the availability of bike sharing stations, bus and circulator routes, and openly encouraging attendees to leave their cars at home. Often the biggest barrier to using alternative transportation is the fear of the unknown – once people know others are using different options, and they try them for themselves, they become our most regular and vocal users! Our downtown should be a place where people feel comfortable, and indeed enjoy, walking around. When they do, it will not be a problem for them to park farther away and walk; take the bus downtown and walk from a stop; or bicycle around as much as possible. Creating any new parking lots or garages will be a last resort as we promote alternative transportation and reduce our dependence on parking downtown. Parking enforcement should be prioritized as a quality of life issue. It must be enforced fairly, appropriately, and consistently. It just makes sense as downtown continues to grow. We need to make a serious commitment to neighborhood safety and this is one important way to do it. We need to encourage bicycling as a viable transportation alternative and make sure cyclists are safe. It will both improve safety and encourage alternative forms of transportation. We need to prioritize our major corridors using safety data. We should pursue incentives for employees who use alternative forms of transportation – “dress down” days; restaurant coupons; Mayoral recognition, etc. Thank you for all of the good work that you do keeping transportation issues at the forefront and supporting neighborhood safety! Fewer cars, more public transportation, cleaner streets during winter months and pothole elimination. Ride sharing, working with RTS to committ busses to larger areas with more work accomodating schedules, making sure street plows clear streets curb to curb, and patching potholes during winter months and creating a rotating maintenance schedule of repair during spring and summer months. The extensive traffic coming in and going out of Rochester from suburban neighborhoods, excessive speeds on neighborhood streets and the excessive use of school buses during peak travel hours. Advocating in Albany for a change in speed limits for neighborhood streets and appropriating enough funding to improve and maintain city streets. Working with RTS to committ to better scheduling of times and routes. Providing incentives for ride sharing and the use of public transportation. Increasing public transportation and ride sharing opportunities will decrease the need for downtown parking. Traffic enforcement is key to reducing accidents and creating safer neighborhoods. This is a top priority. Currently our population would not support these venues. This will decrease accidents and insure the safety of neighborhood children. Bicycle traffic has increased over the years and with the current cooperation with Zagster, bicycle lane expansion is a necessity. Rochester has undergone significant changes in road design that have impeded the effective and efficient travel of citizens and visitors. I believe that a more effective and efficient system needs to be considered in order to improve the safety of our citizens and reduce traffic accidents and tie-ups. That would depend on the street and the traffic conditions. Both would be considerations. Creating ride sharing opportunities and benefits for individuals who carpool and use public transportation. Working with the UofR, one of Rochester’s largest employers and RTA to create a more employee friendly public transportation schedules along with incentives such as reduced bus passes for city residents and Park&Rides for suburban residents. We can also reduce the number of school buses by re-instituting neighborhood schools which would reduce traffic congestion and save money. I envision a Rochester that is walkable and bikeable. A city with robust usage of the sharing economy. A city with an accessible public transportation network. I envision a city where single-occupancy car trips are all but unnecessary. And I envision a city that is ahead of the times in preparing its infrastructure for green – and eventually driverless – vehicles. I want our streets to be safe and accessible for not just cars but bikes, pedestrians and public transit, something we are well on the way to accomplishing with our “complete streets” policy. We are well on our way. As we reinvent our city, we are doing so with the future in mind. Our complete streets policy means that whenever we build or rebuild a road, it must be accessible not just for cars but for pedestrians, bikes and public transit. We are constantly improving our city for cyclists by creating more miles of bike lanes, a bicycle boulevard network, and bicycle safety measures in all corners of our city. We brought ride sharing and bike sharing to Rochester, and are working to raise awareness about the benefits of green vehicles. We created a vanpool program to make it easier for citizens to reach job sites not on the bus line. As our city and our economy builds and improves, our transportation options must keep pace. My administration is working actively with RGRTA and our community partners to review our bus routes to make sure they meet the needs of our citizens. We must lead the way, and bring all community partners to the table. We must ensure that our transportation network works for everyone, and decrease our dependence on cars. We created a vanpool program to help our citizens access jobs in areas underserved by public transportation. We are also working with RGRTA to identify these underserved areas, and increase service. Our bike sharing program has improved accessibility for hundreds of residents, as does ride sharing. The Downtown Transit Center was a crucial step toward this goal, as it made taking the bus easier and sheltered from Rochester’s winters. We are also seeing more residents use ride sharing and bike sharing to get to their destinations. We can encourage bike commuting by continuing to build bike lanes and installing safety measures to protect our citizens. We want to be a “park once” city, meaning that residents, workers and visitors only need to park once Downtown, then be able to walk, bike or take public transit to their destinations. Parking enforcement is necessary to both support businesses, and keep the streets safe for all. No one likes getting a parking ticket, but by enforcing our parking laws, we can ensure a more vibrant and active city. We must continue to look at all options. This is something that is already well underway. We have been putting many of our streets on a “road diet”, replacing traffic lanes with bike lanes, street parking, and traffic calming measures. We are exploring a lower speed limit. We are building a city that is less reliant on cars, so we must adjust our streetscapes to ensure the safety of our cyclists and pedestrians. Exchange, South and Mount Hope are just three examples of streets that we have improved, with many more to come. The bike sharing program was a huge step in this direction, as was the Downtown transit center. We will continue to take measures to make Downtown safer for pedestrians and cyclists. The filling in of the Inner Loop plays an important role in this as well. When complete, the Inner Loop East site will connect our eastern neighborhoods to Downtown, and we hope to do the same with the northern section of the Inner Loop. I would just like to thank Reconnect Rochester for all they do in raising awareness, and helping us prepare our city for the next generation. A comprehensive public transportation system which incorporates bus, light rail and active transportation. It is important for the city to work with all the elected officials to try to obtain federal funding to start building this comprehensive system. In particular we need to start securing funding to start designing and building an effective light rail system which can provide the backbone for this system. Rochester, though densely populated is surrounded by a suburban zone which was built to resist public transportation. Further the dispersion of retail has further complicated the development of comprehensive public transportation. Due to the way the federal government funds public transportation the city will need to take the lead on any attempt to obtain additional transportation money to help transform our system. The fact that RGRTA refuses to provide routes to large employers who do not pay for additional coverage is absurd. They to become more flexible with perhaps some smaller vehicles and more specialized routes. If RGRTA can not be changed than the city needs to recover funding and provide the needed services. The solution is to increase public transportation and one of the way to do this is to create more attractive transportation options like light rail. This will help decrease the need for parking but in the long run this problem will solve itself as increasing fuel costs will decrease the need for parking. Though traffic enforcement is important is should be a low priority compared to other public safety issues. First it would decrease congestion and parking problems downtown and would help familiarize people with public transit. Decreasing the vehicle speed would help make streets safer for youth in our city and decrease active transportation accidents. Bicycling is an ever increasing part of the transportation network and should be encourage when ever possible. It is time that we stopped favoring cars in our transportation network and started to put public safety about driver convenience. I do like providing bike lanes both in the road and adjacent to the sidewalk. Perhaps the best way to do this is the encourage more employees to live in the city with homeowner incentives and tax credits. Further the health care options can use active transportation incentives to encourage other means of transportation other than cars. I would like our network to actually WORK for the residents of the City of Rochester! Currently, the bus system is very time-consuming, and not convenient for riders. More folks would use public transportation if it made logistical sense. I would like to collaborate with the RTS bus company and a large and varied sample of its regular riders. I would arrange informative brain-storming sessions to help iron out the trouble spots in the current system. Once such sessions have been held, I would like to work on the trouble spots, and find solutions to those challenges. The people who ride the bus each day know where the problems are, and will most likely be able to offer astute suggestions. I believe the greatest challenges to Rochester’s transportation stem from the sprawl that was allowed to occur decades ago. The majority of jobs are now located in our county’s suburbs, rather than in the heart of our county, also known as Rochester’s Center City. Because of the very large area that needs to be covered in Monroe County, our public transportation needs are not being met by the current system. The spoke and wheel design is not efficient for the average traveler’s daily needs. I see our City government supporting various transportation methods, to build a system that works for the people of the City of Rochester. From carpooling, to rerouting and rescheduling the RTS buses, I believe that the public transportation *could* be a million times better than it is right now. I also know that this will not happen unless the people who actually ride the buses are an integral part of the planning process. What steps can the City take to improve accessibility to jobs for residents who do not own cars? What steps can the City take to encourage residents who own cars to increase their use of alternative modes of transportation? I would like the City to take a good look at the many great suggestions that we came up with on the Rochester 4.0 Planning Committees. There were many meetings held across the city, and ours in the NW District touched on public transportation as an area that needed improvement. We also noted the under-use of our city’s waterways. We made the suggestion to create a water taxi service (weather permitting, of course), as well as installing a light-rail system that could make access to and from Charlotte faster (for example), and be able to connect to a bus route, or another trolley line(s), that would serve more areas across our county. These, in partnership with carpool lanes on larger roadways, and offering free parking to carpool vehicles in the city might help reduce our city’s carbon footprint. Carpooling would be a great way to help get city residents to suburban job locations. As a council member, I will also do my best to try to get as many businesses to relocate to our inner city, as this would bring the jobs back to the people who need them the most. I especially want to see Rochester be a leader in the clean energy and renewable resource field, so I want to see manufacturing of solar panels and wind turbines (and their components) to be made in the city by city residents, and placed on city homes to help city homeowners with energy costs. Then, to help finance the whole program/initiative, the city can sell the extra energy generated to other municipalities, and can sell the panels and turbines, as we could be a world leader in this global economy. I believe that the current bus system is inefficient, and this is a key reason most people do not leave their cars at home. It should not take two hours to go somewhere that is 20 minutes away. We need a better route for buses to travel, as well as increasing the frequency of the bus runs. When I visit NYC, the bus stop showed a schedule and route, and basically the time was listed as, “The bus will be here shortly.”, and it was! I don’t think we waited five minutes. Now, I completely understand that Rochester does not have the same dense population that NYC has, but our residents deserve to have that type of quality service. If you miss a bus after work in the evening, you are going to wait about an hour for the next bus. That is just not feasible for families and students, or for anyone. We need to get where we are going, and not be waiting for a ride everywhere. That is the main reason people drive their cars, rather than take the bus. There should also be ADA compliant public restrooms available across the city, and more bus stops along the routes rather than removing stop locations. There should also be simple shelters and benches available at bus stops. These could be paid for via sponsorships and advertising opportunities. The top 20 people who run the bus company, based upon salary rate, should use their own service. If they aren’t doing so, the question to ask is “Why not?” as the residents of the City of Rochester and the rest of Monroe County deserve to be treated with the same level of respect that they would expect to receive. I would like the downtown parking to be free, as the fee to park is prohibitive and unwelcoming to customers of our local businesses. Also, as a part-time worker when I was in college, paying to park a vehicle downtown was a larger percentage of my paycheck than I really could afford to pay. This doesn’t help hard-working people get out of poverty. I would like to see underground parking garages utilized, so that we can conserve our valuable green spaces, while using all space efficiently. I think that garages are better than parking lots, as a lot is taking up an area of space that could be used for social interactions with people, and with small businesses to support our local economy. A garage can be built onto a building, and could also have an ecological component, where solar panels and wind turbines could be mounted onto them, as well as green plants/trees could be grown on the side, to help improve the air quality around the building. Unfortunately, from my perspective and experience, I believe the City should prioritize traffic enforcement lower on the scale of urgency. The other issues facing the City of Rochester are on a life and death scale, the highest being the insidious drug use epidemic, and the violence that destroys our neighbors’ quality of life. I certainly encourage everyone to follow the current traffic laws, and to be mindful and courteous to others using our roadways. If these road rules were followed, our streets would be safer for all travelers, and our police could be deployed to more serious and timely matters, like getting guns and drugs off our streets and making better community connections between officers and city residents. I absolutely support studying these options! If public transportation was faster and convenient, most people would use it willingly, rather than out of necessity. These options could also bring more jobs to our city residents, which would lift more people out of poverty. The environmental benefits of using public transportation more often would also help our overall ecological health. I do not currently support a “Vision Zero” style approach to road safety, as 25 mph speed limits do not seem reasonable. I believe the current 30 mph limit suits our community. However, as a councilmember, I would ask my constituents what they want, and would support their desire. If a majority of our city residents wanted this “Vision Zero” style, then I would help create legislation to make it become a reality. My own personal opinion would not override the needs of the people I am elected to serve. Other traffic calming practices and policies would be investigated, and again, brought to the people to make the decision, as they would be directly affected by these changes. In some cases, narrowing of roads, or using round-abouts would make perfect sense, and be a benefit to specific areas; in others, not so much. Overall, I encourage educating the public on the current traffic laws and rules, and would expect people to take personal responsibility for their actions. When I rode my bike, I rode with traffic, near the curb, wearing a helmet and reflective clothing with lights on my wheels. I did not pull out into traffic from between two vehicles, or ride on the wrong side of the road. When committing these acts, people are putting their personal safety in jeopardy, as well as creating a hazard for others who are also using the road. Common sense and education is the key to saving lives. I feel that there are many streets that are simply too narrow to add a bike lane, and keep the vehicle traffic moving safely. I have seen bike lanes that disappear, and bicyclists be put in danger as cars narrowly miss them. On larger, main thoroughfares, yes, bike lanes make sense, and are a wise investment, such as on Lake Avenue, where the bike lane is up next to the sidewalk, and well out of the way of motorized traffic. I do support road changes that are making travel safer for people in our City, but not across the board. I believe we need to act purposefully, and take care not to change something drastically that only needs a minor alteration. I think the people of Rochester would be the perfect resource and sounding board for this question. From my experience, there are locations where crossing Monroe Avenue, Genesee Street, Lyell Avenue, and East and West Ridge Roads is harrowing, and these should be re-evaluated. In some cases, traffic lights might be the best solution, in others, stop signs. In others still, speed bumps or dips might be the best solution. Some other locations might benefit from a pedestrian island, or from a better timed crossing light. Each location has specific challenges, and a carefully thought out plan will make our city more inviting for all. What steps do you think we can take to encourage employees (especially City employees) to commute using transportation options other than single occupant automobiles (walk/bike/bus/carpool/etc.)? I will lead by example, as I intend to carpool to City Hall with Andrew Hollister (Republican candidate), as he is a neighbor who is also running for a seat on our City Council! For other downtown employees, I would think that offering free parking for carpool vehicles would make a huge difference to many employees in our downtown area. Again, I would like the RTS buses to have more effective and efficient routes, and to run with greater frequency. I would also like shuttle services enlisted, as that might entice more people to use the main forms of transportation, while getting around quickly between established bus locations/different routes. I would also offer enclosed bike parking, and not charge for these spaces. The bike locker I used when I worked downtown was secure, but it should not have cost the rate that it did, as the maintenance of a locker for a bicycle is not commensurate with the amount being charged. There also weren’t enough of them, at the time, and that didn’t encourage people to use that method of transportation as an option. As a council member, I will always keep the focus on what is in the best interests of the residents of the City of Rochester. I will encourage the study of different options and new ideas, and not dismiss out of hand any serious proposals to improve citizens’ quality of life. My vision for Rochester’s transportation network really needs to take a look at transportation design. This would require a neighborhood study to determine the walk, bike, and public transportation patterns in each quadrant. For example, some areas of our city biking is used as a major means of transportation and delivery. I have seen and have been part of moving large objects about town using shopping carts, balancing beams on the handle bars, and ghost riding another bike while pulling a trash toter or lawnmower. Let’s observe our streets. Talk to those we see riding and walking in our neighborhoods and ask what/how do you use transportation? What would help you to better achieve your day-to-day goals using Rochester’s transportation network? With these questions, we can help to build a network that fits and grows with its community. I will work with our City Planners, Urban design Centers, area colleges to assist in mobilizing the community members in developing ride, bike, and walking charrettes. Well, how about supporting entrepreneurs and local businesses along transportation routes and the smaller (at first) neighborhood businesses that can hire small numbers from the area within walking distance. A network that includes buses, bikes, ride sharing that breaks down barriers so that everyone in the community can have the opportunity for prosperity. Regularly working with like minded community organizations like reconnect Rochester and ensuring that our public transportation system is responsive and innovative. I will also advocate policies that encourage whenever possible that pedestrian zones get the highest priority. Buses that don’t route to where jobs often are in the far flung suburbs. This is a challenge for poor working families. The city has the ability to advocate and push for pedestrian friendly policies and advocate for things like car sharing, bike sharing and zoning policies that put an emphasis on pedestrian friendly streets. Van pooling and working to attract jobs that are in neighborhoods, so people can walk when possible. We also need to ensure public transit is accessible to everyone. We need more public awareness about the benefits. We also need to make it fun in encouraging different modes of ransportation. Broadly we need to make it possible for people not to have to drive and park downtown. We need more options for a shuttle that travels downtown from areas where people can leave there car. The long term solution is a more robust transit system that can provide timely service to all areas. Traffic enforcement should be a major priority. This will cut down on downtown congestion, parking in particular. This will also encourage exploring downtown and can attract new businesses. This will make Rochester more pedestrian friendly. Bikes are a great form of transportation and promotes good health. East Main St., North Goodman, West Main St. Rewards for using other forms of transportation. Unfortunately we did not receive a response from Scotty Ginett. I envision a #HealthyRochester, where kids can play actively, families can eat healthy, and anyone can get from here to there with diverse transportation options. We must have active, affordable, and convenient transportation options. I will push for an Active Transportation Council/Committee, with representatives from many key local organizations: Reconnect Rochester, Conkey Cruisers, Rochester Cycling Alliance, HealthiKids, and more. This political body will liaise with City Council to develop effective legislation to improve our transportation system. In addition, I would recommend that the City hires someone dedicated to active transportation. I see two main challenges. First, our main transportation system (RGRTA) is controlled by the County, and they do not spend adequate resources in the City. Second, Rochester is neither a particularly bikeable or walkable city. We need to make some significant improvements in our bicycling infrastructure, and increase the walkability of our streets. Addressing the above challenges will require two different strategies. First, we must begin to elect officials that can bridge the relationship between City and County. RGRTA will continue to be run by the County for the foreseeable future, but we can continue to improve the working relationship between RGRTA and the people of Rochester that depend on public transit. Second, we can begin to build the right infrastructure in City Hall to improve our transportation infrastructure. I would start by advocating for a full-time active transportation specialist in City Hall, and an Active Transportation Committee/Council. My website (mitchgruber.com) includes a lot of information about Middle Skills job training. I believe that we have available jobs in our community, but we must be able to train people for those jobs. As part of that process, we must ensure that major employers are on the RGRTA bus line and encourage biking to work. We have done this at Foodlink, where many employees do not own cars. In addition, when possible employers should provide bus passes to workers instead of parking passes. This city is clearly interested in biking, as evidenced by the apparent success of Zagster in the last month. We must invest in better biking infrastructure (bike lanes and blvds). I’d like to create a bike “highway” like in bike-friendly cities like Portland and Minneapolis. In addition, we must continue to work with RGRTA to make this a more viable form of transportation for people with cars by creating new, strategic routes. We need to stop investing in surface-level parking, and encourage the use of public/active transportation. Beyond that, I strongly believe that we need to have data and strategy to create a vision for parking downtown. That’s why I would use my voice as a councilmember to encourage the hiring of a full-time active transportation specialist and the creation of an Active Transportation Committee/Council. There needs to be a strategy when it comes to traffic enforcement. Currently, it feels like different authorities prioritize traffic enforcement in very different ways. We need to make sure that as a City and County, we understand the purpose and goals of traffic enforcement. Again, this is an opportunity for a Transportation Committee/Council. These are innovative solutions that must be addressed by City Hall. I support data-driven approaches that show evidence of creating safer roads and more sustainable transportation usages. I would want any legislation about transportation in Rochester to be data-driven and evidence-based. This is a critical form of transportation, and we need to do a lot of work to improve our bikability. I think this issue is significant in low-income communities, like where I live. Many people use bicycles to get to work and otherwise, but there are insufficient lanes in these communities. We need innovative, data-driven approaches to transportation planning. I don’t have one particular version of the road diet that I am interested in, because I am not an active transportation specialist. I would listen to transportation specialists, and encourage the creation of a Committee/Council to help develop this type of legislation. Improving commuter bus routes and bike lanes, and incentivizing the use of public/active transportation. This shouldn’t be difficult with City employees, since parking near City Hall is incredibly difficult. I don’t have all the answers to these questions, because I am not a transportation specialist. However, I will be the type of legislators that Reconnect Rochester wants. I have a track record of innovation at Foodlink, and I am data-driven as evidenced by my PhD in urban history. Most importantly, I know how to ask the right questions of the right people; that is why most of my answers alluded to the creation of an Active Transportation Committee/Council, which would include representation from Reconnect Rochester. I have always like railways. i would like to see a rail system. I think we should look at transportation in international city’s as they seem to have more experience. Having people willing to think out of the box and do something different. I think Rochester is tied to RTS and will not makes changes because of thier financial interest. The City can focus on added manufacturing business to neighborhoods which help them become walk able neighborhoods. The city should create a rail system where people feel safe and spend less time in than if they had to drive a car. I think they should make parcel 5 green space . I think city should focus on issues or intersection communities say are not safe because of accidents. An order to stop my from driving we need other transportation than bus, taxi, lift, and uber. I have seen speed bumps work in my neighborhood. I have seen people almost hit by cars. If its for safety and saves lives it makes sense. Speed bumps seem to work well. I would gives Bus tokens to employees. Safety and kids at play enriches a kids life. Unfortunately we did not receive a response from Ronald Hall. Rochester needs to adapt our transportation network to meet the needs of its citizens. Many millennials are embracing public transportation over cars. Empty nesters moving into the city are also looking for transportation options that do not involve cars. Buses are the principal public transit method for many city residents and will remain that way for the foreseeable future. However, Rochester should consider bringing back street cars as another public transportation method. Bus lines can be started and stopped at will and thus can be a barrier to development. Having dedicated tracks serve a neighborhood shows a permanent commitment to that neighborhood and increases the chances that development will take place. Look no further than Washington, DC for a real example of how “dedicated tracks” can spur development. The DC metro system has spurred growth near each metro stop. They are also historical and can add to the visual landscape of Rochester. We also need to continue adding bike lanes to our streets, and maintain the bike sharing program. The city could not solely fund a street car line. We would need help from the state and federal government. Buffalo received funding to build their metro system so there is no reason why Rochester could not receive state and federal funds to build a street car network. As for the bike lanes, I would work with city planners and group such as Reconnect Rochester to ensure that we choose the right streets to make dedicated bike lanes. Rochester’s greatest challenge is our sheer size. It can be difficult to get from one side of the city to the other without a car. Our bus system is also not particularly well-designed to move people around the city. It is also hard to convince people to give up their car, especially when they are limited public alternatives. City Council and the mayor’s office must reach out to the community to see what the residents are looking for in a transportation system. The city should also consult stakeholder groups such as Reconnect Rochester. Based on this input, a transportation plan should be created and carried out. The new bike-sharing program is great. It would be great to see this program expanded beyond where they are currently located. We have a bus system that is not effective at moving people around the city. Me must make RTS buses more usable for city residents. We need bus routes that make sense. For instance, my wife happily took the 52 bus from our neighborhood to her place of work (Strong Memorial Hospital). This bus route was abandoned after less than a year. The City can also incentivize more ride-sharing. Lastly, the City can continue to create more and safer bicycle routes. Research has shown that as much as 30% of downtown traffic in some cities can be attributed to people looking for cheaper street parking. To combat this, some cities have implemented Right-pricing parking. According to Donald Shoup: “The right prices are the lowest prices that will leave one or two open spaces on each block, so there will be no parking shortages. Prices will balance the demand and supply for on-street parking spaces.” The city could also implement a “downtown circulator” to move people around downtown while alleviating the need for parking. Long term, creating a street car line that also serves downtown Rochester could encourage people to leave their car at home and take public transit instead. This is a tough question to answer (nice job!). While the easy answer is “of course we should prioritize traffic enforcement,” I understand that it is not that simple. The police force is stretched thin. When I was President of the ABC Streets Neighborhood, I worked with the police department to increase enforcement of the stop sign at Park and Colby (many cars weren’t stopping for the 4-way stop sign). The police increased the patrols and did what they could, but the reality is that they often had more pressing issues to handle and couldn’t be there was much as the neighborhood wanted. The city should look into creating a traffic enforcement division that could be a “wing” of the police department and have them focus on traffic enforcement. I think these are all great ideas. New Orleans and San Francisco utilize street cars/cable cars. These are not only practical ways of public transit but they also add to the downtown landscape. Rochester needs think “beyond the bus” for other methods of public transit that could work with a bus system. As the father of two young children, I cannot emphasize enough the need to lower the city speed-limit. On my street, which has a large number of children and dogs, it is discouraging to watch cars speed down our street. Speed bumps were added a few years ago and that has helped somewhat, but 30 mph is still too fast for our residential streets. It would encourage more residents to use their bicycles and also make bike riding safer by giving bicyclists their own dedicated lane to ride in. It is a common sense approach that doesn’t cost much money to implement and helps reduce accidents and save lives. There was a lot of complaining when East Ave was reduced to two lanes (from four) several years ago but traffic runs smoothly and there is now room for bikes and dedicated left hand turn lanes for cars. I would like to see more of this type of change on other thoroughfare streets in the city where feasible. Again, my wife lives and works in the city. Her bus route was dismantled less than a year after it began. The bus was packed during the AM and PM commutes but was mostly empty during the other times. Many residents who took the bus asked RTS to make the 52 bus a “commuter bus” providing service only during rush hour times but RTS refused and discontinued the route. We need much smarter bus routes for residents who also work in the city. We also need to work with employers to further incentivize ride-sharing. For my final comment, I would like to address driverless cars. This is not abstract idea. Some carmakers — Ford, GM, Honda, Nissan, Volvo, Toyota are all predicting fully driverless cars by 2020-2021. I would like Rochester to be a leader in this area. We need to begin to envision how our cities will change with this new technology, we must imagine and foster this new landscape. We need to start with reforming our archaic city code in a number of areas to foster transportation innovation, smart development, and business growth. First, we must remove barriers to innovation that prevent transportation entrepreneurs from expanding and experimenting with ride sharing technology on a larger scale. City council must encourage RTS to embrace this technology as well and use the data collected to improve routes and meet consumer needs. Second, we can reform our zoning laws to allow for more mixed use development in neighborhoods. This will encourage the growth of office space, restaurants, retail, and other business opportunities in walkable settings. Third, removing burdensome requirements will encourage businesses to take advantage of mixed use development opportunities in the city, further incentivizing people to use alternative transportation options to access goods and services in their neighborhood. Decades of transportation policy at the federal, state, and local level have made owning a car essential for economic opportunity. We’ve invested billions in infrastructure that ensures this mode of transit. It will take a very long time to change that. In addition to this, public transportation has often been viewed as a service strictly for poor people (I hear this constantly). Public transportation must be built, viewed, and developed as a viable alternative to automobile transportation by people of all walks of life. It needs to be built with the goal of bringing people to and from work. Removing barriers to transportation innovation in the private sector will allow entrepreneurs to create unique and inexpensive options for everyone, including low-income residents. In the long term, working with city planners to create a infrastructure policy that encourages multiple modes of transportation will be essential for an equitable transportation network in the future. Allowing for mixed used development and removing barriers to job growth will create jobs right in our Rochester neighborhoods where they will be in walking distance from their jobs. Think of the neighborhoods that this is already possible. Very successful areas such as East Ave, Park Ave, Monroe, Alexander. All of these are zoned for mixed use and they allow for people in the neighborhoods to also work in the neighborhoods. The areas of the city that are Zoned R1 (most strictly) don’t allow for jobs to come into the neighborhoods. Instead you need to rely on transportation out of your neighborhood to find a job. City Council can and should revise our zoning so that it doesn’t prevent jobs from coming into our neighborhoods. City residents will use alternative modes of transportation when it’s available, useful, and affordable. Although many people are willing to take the extra steps of biking, walking, or using mass transit for moral or environmental reasons, most people will continue to use personal vehicles as long as it’s convenient and makes financial sense. Big changes to transportation behavior require cultural and technical changes. By making the changes to mass transit approach, regulations, and city code recommended above, there will be situations where city residents are more likely to have access to alternative transportation options in their neighborhoods and throughout the city. There will be more situations where it will make more sense to walk, bike, or use a service than to take a personal vehicle. There has been a very diverse outlook on parking downtown. Some people (especially business owners) feel as if there isn’t enough parking for their customers, or parking that is convenient enough. While others believe there is an abundance of parking and that there should be less of it. Downtown is already extremely crowded when it comes to development. Adding more parking lots and parking areas isn’t feasible without more development and a significant cost to the Rochester community. As I think about this issue I think both sides need to be considered for a solution. How do you provide the convenience of driving and owning your own vehicle while thinning out traffic and dense parking? Although the easy answer is we should have better public transportation so people don’t need to rely on their vehicles for convenience I don’t foresee that as an overnight or immediately available change. I do believe there is an opportunity for the private sector to create a park and ride option outside of downtown that provides ample parking services and shuttles you downtown to where you want to be, or to a zagster spot. Businesses can offer vouchers to their customers to cover the parking and they can maintain the convenience. If done right you could pay the same as you do for downtown parking without actually needing to find a spot while maintaining the convenience. Another option would be to leverage technology and build an app that will track open parking spots, so that people can quickly find the closest available parking spot. Other cities have done this successfully. We need to be more innovative with our city government so we aren’t continuously behind the times. Aggressive traffic enforcement does not necessarily solve safety problems for the people of Rochester. We some traffic enforcement for a few reckless individuals, but it’s often used to generate revenue and it can lead to unnecessary conflicts between police and citizens. Traffic safety could be improved with better design. By designing our streets to slow down cars, respect cyclists, and draw attention to pedestrians, we’ll improve safety outcomes without needing to resort to ineffective punitive measures. Building a mass transit network that is financially sustainable is incredibly difficult. When building a fixed route streetcar system, getting it right is critical. Studies aren’t conclusive but we can look to market behavior as our guide. City Council should reduce regulatory barriers to allow the private sector innovative rapid transition options in Rochester (think Uber, Lyft, and Zagster all of these are private sector solutions to problems that local government have failed to solve). These solutions may fill the need for mass transit solutions or demonstrate the need for public investment in costlier transit infrastructure in popular travel corridors. As mentioned in the answer on traffic enforcement, structural changes to our streets play a critical role in improving safety for our citizens. As someone who grew up riding my bike on the streets of Rochester and using my bike as a commuter, I know how important bike infrastructure is. My bike was my first mode of transportation to my first job, and I was hit by cars not once but twice while riding my bike. There’s a growing trend of people cycling in Rochester for commuting and recreation. The city should continue looking for affordable options to improve bicycle safety through defined lanes, protected lanes, and measures to encourage safe road sharing with vehicles. Every time a cyclist or pedestrian is injured or even killed by a driver, it’s heartbreaking. As I mentioned, I’ve been struck while riding my bike too. Many of these accidents are preventable. Our streets must be built for an urban environment where people live, work, walk, and play. Streets designed to slow drivers down and invite them to recognize potential conflicts will do far more to improve safety and livability in Rochester than traffic enforcement on roads that invite drivers to speed and drive recklessly. That’s why I would support road diets and changes to road configurations for select problem areas in the city. There are so many busy streets to name off it would probably be easier to name the streets that don’t need it. Lake Ave and Main street are some of the first that come to mind, but there are so many more in every neighborhood in our city. Many of these streets are busy and dangerous for pedestrians simply do not have any space at all to be on the street with a bicycle. I’m not a fan of handing out taxpayer dollars as incentives. I’d much rather use them on our residents and neighborhoods. If we remove any subsidies for parking and allow prices to reflect the actual cost of maintaining parking lots we will see people do this on their own. They will look to carpooling and ask for better transportation options themselves. They may even collaborate and come up with an amazing idea that hasn’t been thought of yet as a solution. Our government is constantly looking to reinvent the wheel with our public transportation. I have visited cities that we never once used a car in. We were able to get from one end of the city to another conveniently at very little cost in the same amount of time that we would have in a car. We must look to those cities and their infrastructure instead of trying to make new solutions that do not work. We’ve done that time and time again. It is consistently failing. Sometimes it is better to acknowledge that the solution has already been found and adopt it. An example of this is our downtown transit center. We spent a lot of money, lost service areas, and don’t have better transportation, why did our local government choose this over a model that has been proven to work in cities our size? I would like to see Rochester’s transportation network include more alternatives to single occupant vehicles, while empowering and protecting cyclists and pedestrians. While ride sharing services like Lyft and Uber are helpful in reducing the number of vehicles on the road, increased investment in bicycle infrastructure would further reduce automobile reliance. As a member of City Council I would push to continue expanding the number of bicycle rental kiosks and make sure they are distributed evenly among all our cities neighborhoods. I would also asses areas where speed humps, stop signs, and other traffic control devices could be deployed to increase compliance with speed limits. Rochester’s greatest transportation challenge is overcoming a highway system that was built to accommodate America’s reliance on automobiles. Filling in the Inner Loop was a vital first step towards reconnecting our neighborhoods and increasing pedestrian mobility throughout the East End/Down corridor which is vital to the economic success of our city. Prioritizing people over automobiles is the key to revitalizing our City and overcoming the legacy transportation system designed specifically for automobiles. Advocacy and providing some funding for programs that increase access to alternate forms of transportation. As a routine part of the City’s economic development efforts, businesses which seek tax credits and other financing assistance should be required to either demonstrate their location is accessible by existing public transportation options, or contribute to the cost of expanding public transportation. This would incentivize density, while preventing urban sprawl, and make jobs more accessible to city residents. Increasing the number of bike rental kiosks is a great way to encourage people to move around without relying on vehicles. Similarly, partnering with local business to provide coupons and gift cards as incentives for residents to ride buses several times a month would both reduce traffic congestion and emissions, but it would also provide publicity for new businesses. Most importantly, incentivizing ridership on existing public transportations options increases familiarity and helps eliminate the psychological barrier of trying something new for the first time. My broad vision for improving the traffic situation downtown is to facilitate policies and planning decisions that ultimately reduce the total number of cars downtown at any given time. We should not be trying to make parking easier and encouraging vehicle dependence, we should be creating a more robust and holistic public transportation system that allows people to get where they want to be without taking a car. Reducing the number of vehicles that are on city streets would make walkers and bikers more comfortable sharing the road and sidewalks. I support a feasibility study for transportation alternatives as a way to jump start the potential virtuous cycle that could result from the use of street cars, circulators, etc. Yes. I support a 25mph speed limit and the implementation of traffic calming practices because we need to ensure that pedestrians and cyclists feel safe sharing the road. By making roads narrower and building protected bike lanes, we can both protect our residents who already ride bicycles and encourage new riders to leave their car at home. The bicycle lanes provide a safer space for the use of bicycles to transit around our city. I believe we should work to provide more lanes like those alone lake ave in Charlotte where there is a path next to the sidewalk. The road diet or change in road ways will greatly increase the safety for all commuters. Incentivize carpool through preferred parking and reduced rates. Stipend for alternate vehicles. Bus passes for commuters or reduced rate. Unfortunately we did not receive a response from Ann Lewis. My vision for Rochester’s transportation network is that every citizen will have adequate access to affordable transportation. I plan to achieve this by working within my governmental capacities to work with our Federal , State, County and local leaders to make this a reality. Making sure transportation is convenient and affordable. I feel City government plays a major role in leading the way to helping to assure adequate transportation for all citizens such as recent roll that City played in Zagster bikes. I like the ride sharing program that the Mayor started with casino. I think more ride sharing programs can work in our community. I think we have to look at how other cities our size are dealing with this situation and implement ideas that work. Look at whats working in other Cities our size. I support surveying the community as to what the community wants to study so we don’t spend unnecessary public dollars on studies. For public safety I think it a good idea. I like whats been done on Jefferson , Thurston, Ford street. Maybe some types of incentives would work? My vision for Rochester’s transportation network is a system that is so accessible, user friendly, and intuitive that everybody uses it, not just those who don’t have other options. I also dream of a transportation system that creates equity of access for those same people without options so that they don’t spend hours away from their homes and children just to get to a job that barely pays the bills. I dream of a transportation system that is uplifting and brings people together, something that we can take pride in. I plan to achieve this vision for Rochester by working with RTS and organizations like Reconnect Rochester as a city councilperson to re-imagine our transportation system and develop proposals that fit our city and our needs. We can also use van pools to save money where it makes sense and work to appoint people to the transit authority that are invested in and passionate about public transportation so that more dollars can be directed towards these projects. Rochester’s greatest obstacles are budget, system design, lack of transit oriented design and lack of comprehensive walking and biking infrastructure. Our transportation system also has an image problem where there is a negative connotation around using public transportation because it has been inefficient, hard to use, and poorly maintained for so long. Branding can go a long way in encouraging millennials and folks who have cars to use public transit and feel a greater sense of social responsibility in their transportation choices. I think it is important for members of city government to actively advocate for improvements in our transportation network and not just wait for proposals to come across their desks. I will be a strong voice for transportation on city council as a climate and social justice activist and will work to educate my peers and other city leaders on the exponential benefits to a community like ours of having a robust and equitable network. Whether it is reducing segregation, lifting people out of poverty, taking care of the environment, or contributing to overall quality of life, there is something almost anyone can relate to and get behind in the list of benefits of a healthy, accessible public transportation system. Aside from expanding and improving access to public transportation, the city can incentivize businesses to build and develop along transportation routes that already exist. The new Zagster system is a great way of improving accessibility because the bikes can be locked at any bike rack, and I would like to see that program expanded. I would be thrilled to see the use of cooperative ride share and car sharing ventures. First, it has to be accessible and intuitive enough for it to make sense to use for people who have busy schedules and limited capital in the areas of time and energy. Second, by rebranding our busses and running public advertising campaigns about the social and environmental benefits of using public transportation we can attract and capitalize on the desire for and understanding of public transportation that is already there in our community. I believe there are lots of people in Rochester who want to use public transportation and believe in the benefits for whom it is not yet a viable option. If we can give them a system that makes sense to use and fits into their lives, I believe they will make an effort to take advantage. By improving our transportation system and increasing multi-modal transportation options, we can reduce the number of cars descending on downtown. I’d also like to see more park and rides in the suburbs with regular service so that it is convenient for people to leave their cars and take public transportation downtown. I do not support building more parking garages. I believe that consistency in traffic enforcement is important – it affects people’s lives – but we can also reduce the need for enforcement by enacting traffic calming measures that free up human resources and energy, creating less conflict between citizens and police and sustaining a system that manages itself. These strategies have worked in other cities and are effective in bringing people together and connecting high traffic areas while increasing economic development, quality of life, and improving access to our most valuable assets. I agree with the Vision Zero initiative in that “no loss of life is acceptable” and that we can design our streets and city to be so safe and friendly to walkers and bikers that severe injuries and fatalities can be a thing of the past. Whether it is speed limits, speed bumps, road dieting, road painting projects, roundabouts, or protected bike lanes, there are so many thoughtful and strategic ways to plan our city for safety and we can learn a lot from other cities who have taken the lead on these initiatives. A bicycle lane network doesn’t just benefit the people who are already using bikes instead of cars, it will encourage people to bike and do so even more while reducing the negative effects of cars on the environment and getting people out of their cars and into their communities, interacting with and lifting the spirit of the town. There are definitely folks in the community who would bike to work if it was reliably safer to do so. The safety of our roads for everyone, especially pedestrians and bikers, is extremely valuable and we will reap the benefits for generations. The city can incentivize public transportation for its employees by providing bus or Zagster passes to city workers who live in areas where transportation is already accessible. I think Reconnect Rochester is doing an incredible job of championing these changes and strategies and educating the public on why this matters and I look forward to working with them and elevating their voices and ideas in our city conversations. Series of transportation options that includes walking, biking, ride-sharing, public transit and private vehicles. Available at all times to all people. Have supported legislation to introduce uber/lyft, reduce regulations on taxis, increase bike lanes, improve public transit, introduce bike sharing. Transportation options for people with disabilities, transportation at all hours, transportation at all destinations. We are responsible for bike lanes, street construction, oversight for public transit. We have implemented van pools, and supported ride-sharing/bike sharing. I will continue to lobby RGRTA to provide more off-hours service to non-city work destinations. We can right-size parking, and possibly offer incentives (financial, or other) to residents who alter their transportation methods. We have more spaces now than are needed, but not in the right places. I will advocate for a circulator (bus/trolley) that can move people as required. We must be careful not to overbuild parking as options to private vehicles increase. I would like to see traffic enforcement given higher prioriy. Circulator, and streetcar optons could help resolve the parking concerns. A Vision Zero approach could help improve road safety and help eliminate deaths due to road design problems. Bicycles are among the most democratic transportation options. They don’t require a license, insurance or inspections. I will continue to advocate for bike based transportation options. Lane reduction measures such as bumpouts, roundabouts, and bike lanes have proven to increase traffic, bike, and pedestrian safety. We are currently working on Main St, and I would like to see more work done on Lake Ave, Mt. Hope and Mt. Read. We can look at providing subsidies or other economic support to employees who decide to commute using alternative methods. We need to reduce the “stigma” of non-car transportation options. Our city, like most, is car centric and anyone not using a car is seen as “less than”. Unfortunately we did not receive a response from Jackie Ortiz. Unfortunately we did not receive a response from Loretta Scott. Unfortunately we did not receive a response from Marcus Williams. Reconnect Rochester would like to thank all of the candidates (and their teams) for the time and effort they’ve dedicated to our community, and for taking the time to answer our questions. We look forward to working with them very soon. Who will you be voting for Mayor? *Your vote will remain anonymous. 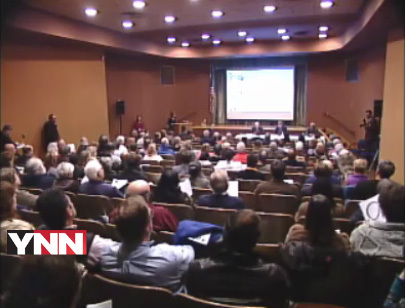 This past Tuesday evening Reconnect Rochester co-sponsored a Mayoral forum on issues related to land use, neighborhood urban planning, transportation, development and revitalization. Bill Johnson, Tom Richards, and Alex White went toe to toe and Rachel Barnhart (WHAM 13 News) moderated. In all, well over 200 people turned out and submitted questions ranging from planning to poverty. 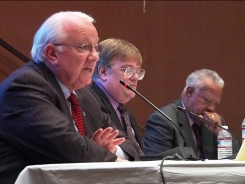 The event was the first extended, in-depth forum of Rochester’s mayoral campaign and was covered by several local news outlets including YNN, WROC, and the D&C. Now, in the famous words of sportscaster Warner Wolf, “Let’s go to the video tape!” And let us know what you think of the candidates’ responses in the comments section. 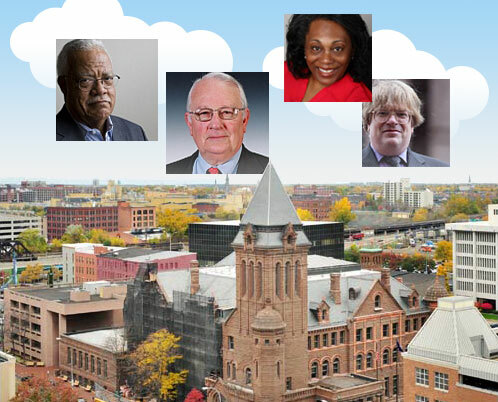 While Rochester searches for its next mayor to take office and begin the arduous task of planning the City’s future, Reconnect Rochester is taking the issues to the candidates and the candidates to the people.